A somewhat short notice seak peak, but as always with Plantation Rum this should be an evening worth dropping whatever you’re doing to head to this month’s London Rum Club. So if you like drinking great rum, get yourself down to Portobello Road’s Trailer Happiness, for a 7pm start on Monday 5th September 2011. The evening will be presented by Bibendum Spirits Paul McFadyen, who will no doubt be bringing his usual bouncy charm to the evening’s tasting of what should be another great Rum Club. In Paul’s own word’s he’s “Launching the new Plantation Guatemala and with a few new surprises…”. What these surprises are, I’m unsure, but then it wouldn’t be a surprise anymore if I did spill the beans… What I do know though is that with such a large range of blended and vintage rums, Plantation Rum tastings are always legendary and any new additions are always eagerly anticipated. 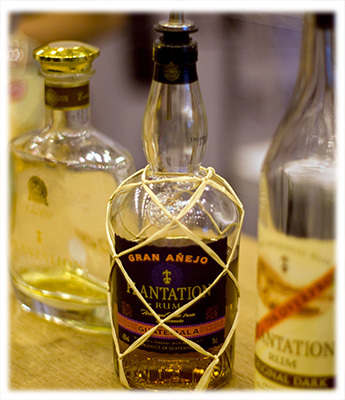 As such, starting with this year’s Imbibe Live Show, the focus of recent tastings has been the latest addition to the family – Plantation Gran Añejo Rum from Guatemala. Just released to the UK market, it’s still not widely available, so if you can’t wait to get your taste buds round this excellent premium mixing and sipping rum, then you know where to be tomorrow evening. Further details on tomorrow’s tasting can be found on the Plantation Rum Club Facebook page. For those interested in learning more about the London Rum Club, please either visit the Rum Club website or pop into Trailer Happiness and speak to the bar staff.